An interesting note about the Fox translation: it was created not just to be literal but also to capture the spoken rhythm of the words. So on paper it seems jagged and repetitive but, of course, so are the Hebrew and Greek original texts. The original was intended to be read aloud and so is the Fox translation. Consider the opening of Genesis: “When the earth was wild and waste, darkness over the face of Ocean, rushing-spirit of G-d hovering over the face of the waters–G-d said: ‘Let there be light!’ And there was light. G-d saw the light: that it was good. G-d separated the light from the darkness. G-d called the light: Day! and the darkness he called: Night! There was setting, there was dawning: one day.” Try reading it out loud and you’ll feel in its rhythms the strangeness and grandeur of creation. 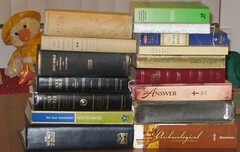 Hi Ruth, I might have also included the Jewish Study Bible in the list with the JPS versions. Thick and chock full of useful information and related essays.